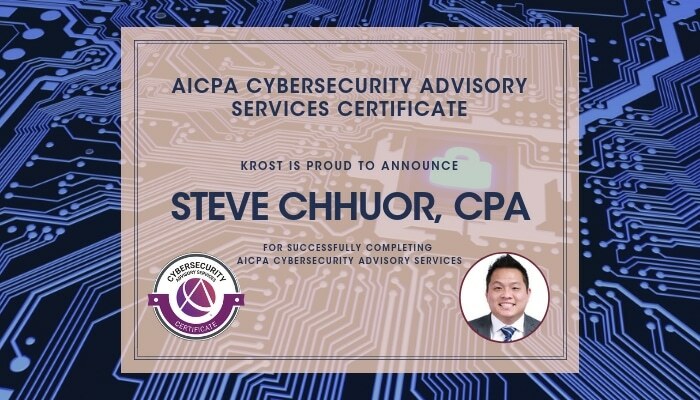 Recently, KROST team members have devoted time to further their training and expertise in cybersecurity by earning AICPA’s Cybersecurity Advisory Services certificate. Cybersecurity risk is evolving daily and as experts, we need to continually expand our knowledge to properly detect, respond to, mitigate and recover from security risk. Assurance & Advisory Manager, Steve Chhuor, CPA, was one of our staff who earned his certification this year. With a decade of experience, Steve is a trusted advisor. When asked about his experience with the course, he made it clear that staying informed of new developments is key to properly understanding and addressing risk. “Cybersecurity risk is an ongoing issue that most clients and companies aren’t fully aware of until it is too late, and breaches/hacks have occurred. It is in our client’s best interest to understand the full scope of risk and determine how they want to protect the organization’s assets and how to detect and recover from breaches,” remarked Steve. Cybersecurity breaches are extremely costly due to loss of operations and recovery. Therefore, cybersecurity risk management is vital to all companies of any size. The cybersecurity course gives an overview of cybersecurity risk management, identifying and protecting assets, detecting threats and identifying failures, and reacting to threats and failures. Given the fast-evolving nature of cybersecurity threats, continued education on the subject ensures that KROST’s team of advisers have the latest knowledge to combat client concerns, and to more effectively assist in the implementation of a Cybersecurity risk management program. The KROST assurance and advisory team can perform cybersecurity risk assessments. These assessments are a great opportunity to help understand the full scope of cybersecurity risks that an organization is exposed to during any given day. After a thorough assessment, KROST can advise organizations and businesses on the implementation of a cybersecurity risk management program or help modify a current cybersecurity risk management program to mitigate risk.